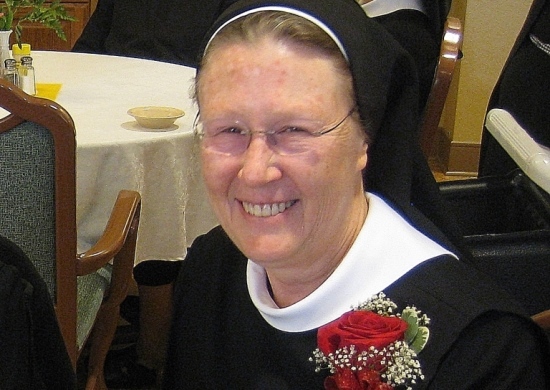 The feast of St. Scholastica was a special day for Sister Kevin Hermsen. She celebrated 40 years as a professed sister. She said, “It seems like just yesterday, I was this young woman walking down the aisle. I was talking to my mother and she didn’t believe it had been 40 years.” Sister Kevin remembers the day vividly. It was her brother’s birthday and Easter Monday. Three celebrations wrapped into one day. For over 30 years, Sister Kevin was a radiologist technician. For most of those they were spent working at Providence Medical Center in Wayne, Nebraska. They were excellent years with excellent coworkers and patients. She continued her work in healthcare until she was elected to the Prioress position in the Norfolk Priory. Lots of moments stood out for Sister Kevin over the last 40 years. She couldn’t pick just one as the most memorable. “So many things happen like standing at the bedside of a dying sister, being elected as superior and making profession.” They all stand out in their own way as well as countless other moments. As for what Sister Kevin is grateful for it’s the community and the support of the community. She couldn’t do what she does without her fellow sisters’ support.